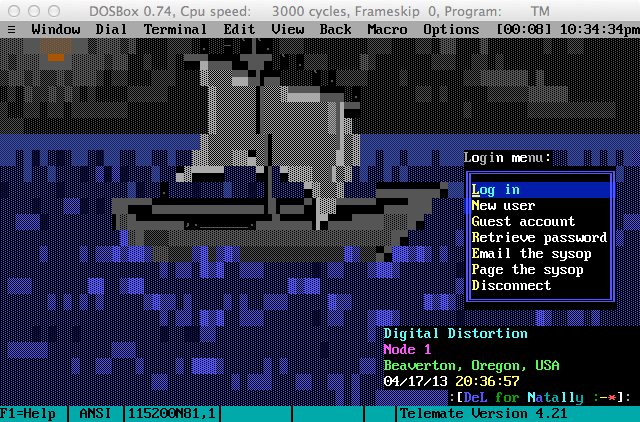 Login screen for Digital Distortion BBS as seen in Telemate under DOSBox. A few months ago I wrote about my experiences trying to telnet in to Atari BBSes using an emulated Atari on my Mac. Basically the solution boiled down to this: Use tcpser4j to change a telnet connection to a serial connection, use socat to pipe that serial connection to a file, and set the Hatari emulator to use that file as a virtual RS232 device. After those steps, I could run my favorite old Atari ST terminal programs like ANSIterm and Freeze Dried Terminal. Recently I decided I wanted to do the same thing with a DOS emulator like DOSBox — but for different reasons. This entry was posted in Uncategorized and tagged ansi, bbs, dos, dosbox, emulation, pc, telemate, telnet on Apr. 17, 2013 .